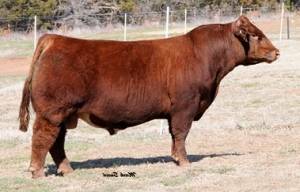 If there was a bull in Griswold’s 2013 sale that spelled out POWER it would be Red Rider. He was the high seller in the Grass to Grid sale. With extra look, dimension, and rear quarter he’s pretty easy to love. He has all the power you could want in a bull but still has the ability to move out with ease. This kind of bull will take a seedstock program to a whole new level. Just imagine what a bull like this would do on a set of Red Angus cows.